Yes, yes, I know, officially my publishing date is tomorrow, but in honor of the last day of 30 Days of Dragons, I'm doing something special. 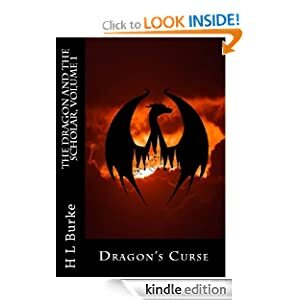 I sneaked Dragon's Curse onto Amazon.com as a kindle eBook and put it up today for FREE! Yes, today you can get a slightly advanced kindle copy of Dragon's Curse for absolutely nothing. If you don't have a kindle you can download Amazon's free app to read kindle files on a smart phone or computer. Just click on the link below to get started. If you do take advantage of this, I would be so happy if you took the time to review it afterwards. The paperback will be up on Amazon sometime tomorrow for all of you who prefer are the feel of a book in your hands or have some money to spare. So grab your free eBook and enjoy! Edit for more info: the paperback will be available tomorrow if you are old fashioned like me or just want something you can hold. I do not receive money for the books given away, but the hope is that those who grab a free copy will review my book and so it will start off its time available for sales with multiple reviews in order to lure readers in. A lot of readers aren't willing to invest in a book from a new writer without seeing someone else recommend it first.